It's still working perfectly, she still can make a call and send a text with that phone. 2. 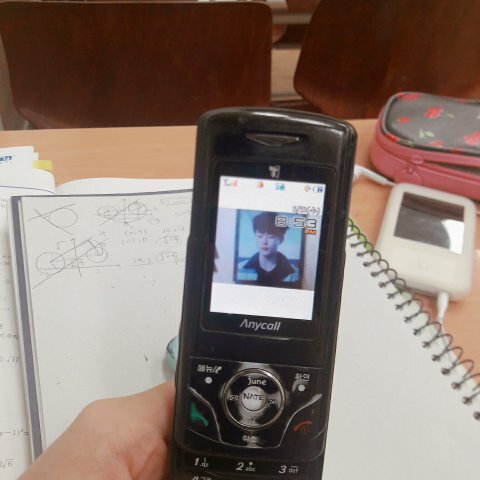 [+39][-53] Crazy.. F*ck.. That's so freaking cool.. Do primary school students these days even know that thing..? 4. [+16][-0] Crazy.. That's a slide phone.. I really miss using those kind of phones lately..
6. [+8][-0] I like old phones better.. I hate being a smartphone's slave..
8. [+6][-0] Crazy..ㅋㅋㅋ I also have the similar one in my house! 10. [+4][-2] Oh Gosh.. That's our Seonho right there!